These best convertibles mutual funds are selected based on its performance for the past 5 years. Most of these convertible bond mutual funds are also rated among the best in their category. I have also provided some details about its management, performance, sales load, expense ratio, initial investment requirement, risk, top holdings, etc. 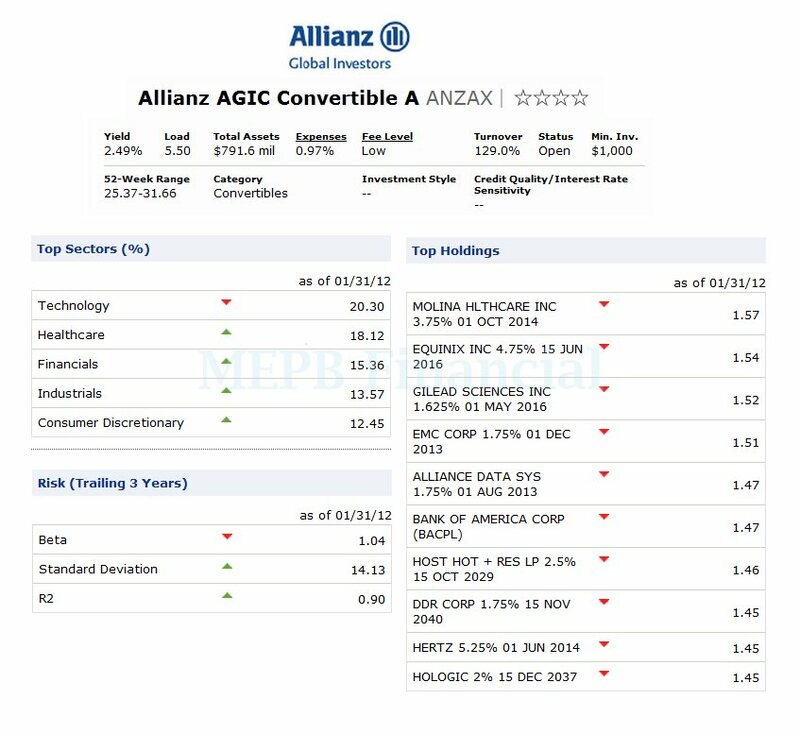 The Allianz AGIC Convertible fund objective is to provide maximum total return through capital appreciation and current income. This mutual fund invests most of its net assets (>80%) in convertible securities. It may invest in corporate bonds, debentures, notes or preferred stocks, nonconvertible debt securities, and their hybrids. It may invest in securities of any size market capitalization or credit quality. This top convertible mutual fund receives 4-stars rating from Morningstar. The 12-month dividend yield is 2.57%. The fund has YTD return of 5.31%. Douglas G. Forsyth has started managing this fund since 1994, while the class A of this fund was officially introduced to market in 2010. The fund has annual expense ratio of 0.97%. There is no retirement account available. The fund can be purchased from 28 brokerages. As of January 2012, the top 5 sectors are Technology (20.30%), Healthcare (18.12%), Financials (15.36%), Industrials (13.57%), and Consumer Discretionary (12.45%). The Invesco Convertible Securities fund utilizes its assets to purchase convertible securities including bonds, preferred stocks or other securities. These convertible securities may be converted into a prescribed amount of common stock at a predetermined price. It may invest small part of assets (20%) in common stocks directly, non-convertible preferred stock, non-convertible fixed-income securities and foreign securities (including depositary receipts or ADRs). This convertible securities mutual fund is currently managed by Ellen Gold. The fund has 1.97% of dividend yield. The 5-year annualized return of this hybrid fund is 4.91%. Morningstar has ranked this fund with 3-stars rating. This mutual fund has annual expense ratio of 1.09%. The average in the category is 1.15%. The minimum initial purchase is $1.000 for brokerage account and $250 for retirement account. The maximum sales charge is 5.50%. 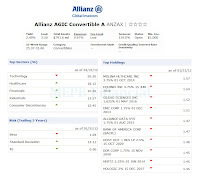 The top holdings as of December 2011 are Sandisk Corporation (1.41%), Equinix Inc (1.38%), Gilead Sciences Inc (1.36%), Teleflex Inc (1.35%) and SBA Communications Corp (1.34%). 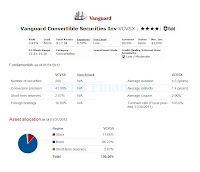 The Vanguard Convertible Securities fund is one of the popular convertible mutual funds. 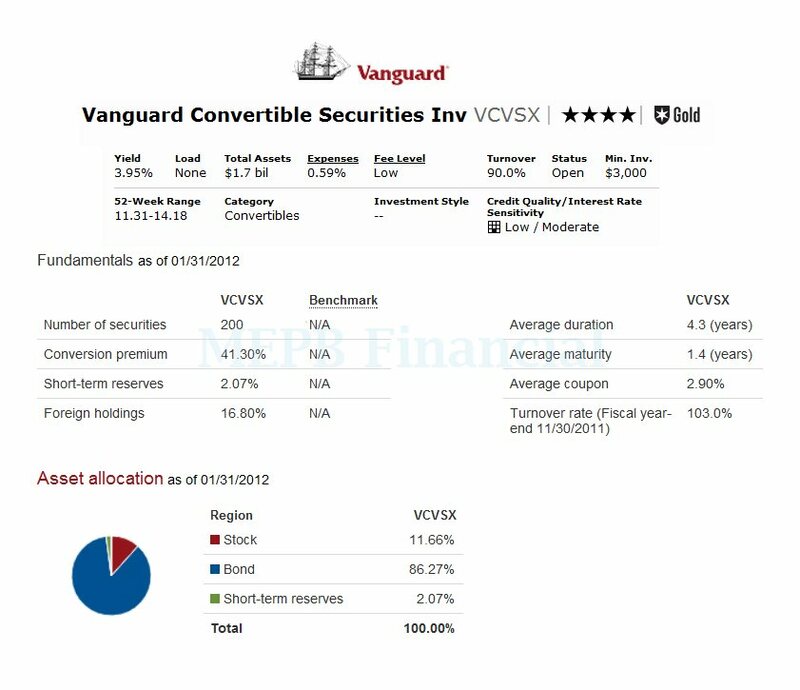 This Vanguard fund is trying to provide current income and long-term capital appreciation. This mutual fund uses its assets to purchase convertible securities that combine the investment characteristics of bonds and common stocks. Convertible securities include corporate bonds and preferred stocks that are convertible into common stock. This convertibles mutual fund has total net assets of $1.72 billion. It has an expense ratio of 0.68%. There is no sales load. This best fund was first introduced to public in 1986. The YTD return is 5.57%. Morningstar analysts gave Gold rating for this fund. For the past performance, it has 4-stars rating as well. The annual holdings turnover as of February 17, 2012 is 90.00%. Larry Keele is the current fund manager. The fund’s 10-year annualized return is 7.27%. The top 10 holdings as of January 2012 are Micron Technology Inc, Gilead Sciences Inc, SBA Communications Corp, Intel Corp, MGM Resorts International, Lennar Corp, SanDisk Corp, Lam Research Corp, General Motors Co and United States Steel Corp. The investment objective of Mainstay Convertible Fund is to provide capital appreciation and current income. This Mainstay fund typically invests >80% of assets in investment-grade convertible securities. It may also invest in equity securities, nonconvertible corporate debt, U.S. government securities, and/or cash or cash equivalents. Morningstar has rated this best convertible mutual fund with 3-star rating. It has YTD return of 5.32%. The dividend yield of this fund is 1.96%. The annual expense ratio is 1.19%. The current lead manager is Edward Silverstein. He is the Director and Head of the Convertible Division. The minimum initial purchase is $1.000 for brokerage or IRA account. The fund best 1-year return was achieved in 2009 with 42.40%. The other classes of this fund are Class A (MCOAX), Class B (MCSVX), Class C (MCCVX) and Class I (MCNVX). The top 5 sectors of this MCINX fund are Consumer Non-Cyclical (29.7%), Energy (19.5%), Technology (12.3%), Communications (10.7%) and Consumer Cyclical (8.8%). 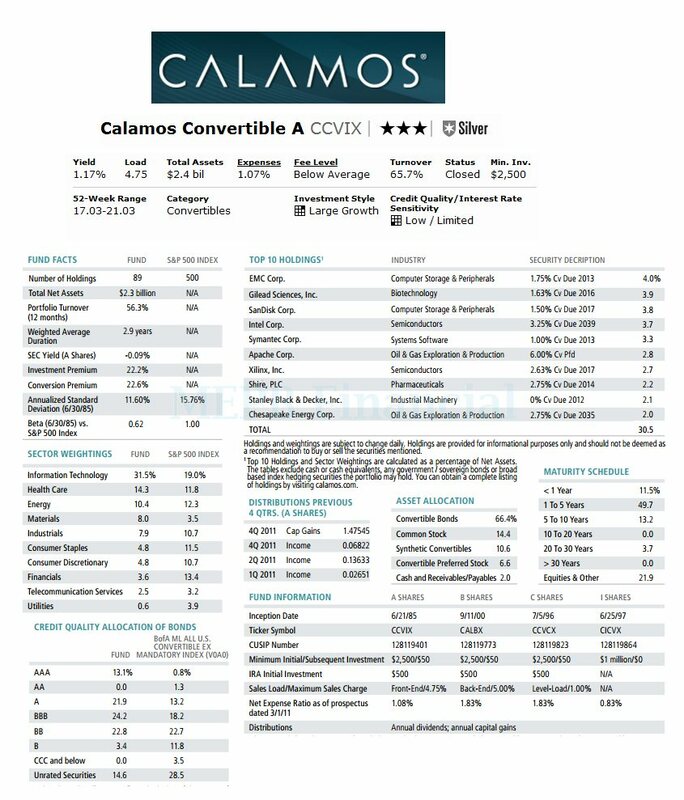 The Calamos Convertible fund invests majority of assets (>80%) in convertible securities issued by both U.S. and foreign companies with any market capitalization. The average term to maturity of the convertible securities in this fund have a range 2 to 10 years. 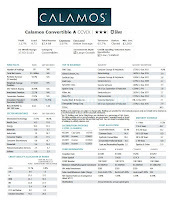 This convertible mutual fund is directly managed by the founder of Calamos Asset Management, John Calamos, Jr. The annual expense ratio of this fund is 1.07%. The fund has total net assets of $2.38 billion. The most recent yield is distributed on December 2011 ($0.07). This top performer fund is available for purchase through 94 brokerages. The maximum sales charge is 4.75%. The top sectors weightings as of December 2011 are Information Technology (31.5%), Health Care (14.3%), Energy (10.4%), Materials (8.0%) and Industrials (7.9%). The PIMCO Convertible fund objective is to achieve maximum total return with prudent investment management. This PIMCO mutual fund typically invests most of assets in a diversified portfolio of convertible securities. It may use forwards or derivatives such as options, futures contracts or swap agreements. It may also invest some of its assets (<20%) in both investment-grade securities and high-yield securities. This convertible mutual fund has 10-year annualized return of 6.91%. The total net assets are $1.63 billion. Based on the load adjusted return, the fund has returned 20.24% over the past 3-years. The YTD return is 5.34%. It has 3-stars rating from Morningstar. This PACNAX fund is managed by Jonathan L. Horne. The management fee is 0.25%. The top industry sector exposure is Technology (25.03%). This Fidelity Convertible Securities fund has a yield of 3.11%. As part of no sales load fund, this fund has total net assets of $2.2 billion. The expense ratio of this convertible mutual fund is 0.61%. Morningstar analyst has rated this fund with neutral rating. The Putnam Convertible Securities mutual fund is rated with 3 stars rating by Morningstar. The annual turnover rate is 79%. The minimum initial investment is $500. The top 3 equity sectors are: Communication Services, Consumer Cyclical, and Technology.